Pacific Beach, south of La Jolla and north of Mission Beach, is known for its youthful energy, beaches and nightlife. PB, as it’s known by the locals, is the most popular beach destination in San Diego and draws large crowds in the summer. It features one of the larger local nightlife scenes, with a wide variety of bars, clubs, eateries and coffee houses. Some of the favorite local watering holes include sports bar PB Bar and Grill, Typhoon Saloon and Johnny V for dancing, Bub’s for the dive bar ambiance, and Tower 23’s JRDN Lounge for a drink with an ocean view. As a tourist destination, commercial development in Pacific Beach has increasingly targeted the visitor population. About 1,300 businesses pay into the Business Improvement District, with visitor and community businesses concentrated along Garnet Avenue, Mission Boulevard and Cass Street. Retail, dining and entertainment businesses are clustered along Garnet Avenue, and the main thoroughfare is largely lined with restaurants, nightclubs and boutiques featuring independent local brands, trendy and designer goods, surf-related merchandise and souvenirs. Pacific Beach is known as a haven for post-collegiate party-goers and surfers, but as real estate prices continue to increase, it is becoming home to more young professionals and families. 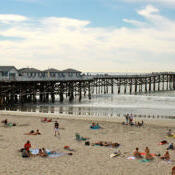 PB, as it’s commonly called, is the most popular beach destination in San Diego and draws large crowds in the summer. It features a large local nightlife scene, with a wide variety of bars, clubs, eateries and coffee houses. In addition to the night’s entertainments, there’s plenty to do in PB, from surfing and water sports at the beach to biking, rollerblading, strolling and people watching along the 3-mile boardwalk. Boutiques and restaurants line the boardwalk and Garnet Avenue, the main thoroughfare through PB.